What does it profit a man to gain the whole world and forfeit his soul? 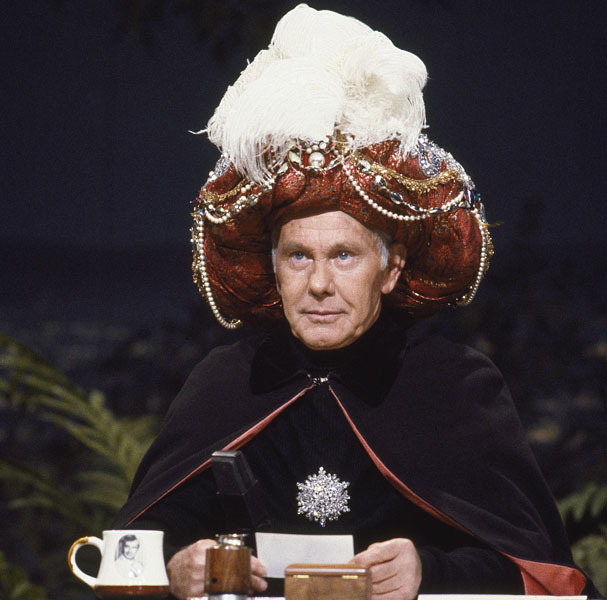 For thirty years (1962–1992) Johnny Carson hosted The Tonight Show, presiding over the pinnacle of American popular culture. He was a star among stars, loved by millions, respected by his peers, the big-break bestowing godfather to many of the biggest names in Hollywood. Yet he died alone. Johnny Carson is a warts and all portrait of the man dubbed the King of Late Night. Focusing on Carson’s years at the height of his fame, wealth and power, it’s a memoir written by his lawyer and close confidant, Henry Bushkin. For eighteen years, prior to an unceremonious and acrimonious parting, Bushkin was Johnny Carson’s personal legal adviser, fixer, confidant, and close friend, frequently referred to on the on the Tonight Show as “Bombastic Bushkin”. Johnny Carson (published by Eamon Dolan/Houghton Mifflin Harcourt, October 2013) To find out more click here. Could anyone else have written this book? Would anybody else have dared to? Not that I can imagine. After all Doc Severinson is still performing due to Carson and The Tonight Show. Doc was “appalled” at my book. Why? Because Johnny was shown to be a human being as opposed to simply being presented in a puff piece a la Ed McMahon’s book. Jerry Seinfeld said he was never so nervous before a performance as when he was first about to go on with Johnny Carson. What made Carson so important? The answer is simple. Carson made careers. If Johnny invited a young comedian to sit by the desk after a routine-it was nirvana for the unknown. Carson was a star among stars, eminent in high society on both the East and West coasts, but how did his rural Iowa roots feed into his later public successes and private failures? People of Johnny’s generation who grew up in Iowa and Nebraska had a difficult time sharing or expressing real emotional content. I call it the John Wayne tough guy approach to feelings and thoughts. In a Presidential election cycle that features both Trump and Sanders as serious contenders, do you ever find yourself missing the cultural cohesion brought about (or exemplified) by figures such as Carson, Cronkite and Sinatra? Carson’s died owning about half a billion dollars. He was very much not in the 99%. Yet he opposed the Vietnam War and capital punishment, as well as favoring racial equality at a time when many Americans did not. Where would his inclinations be taking him in 2016? Would he look with any favour on Jim Webb’s possible run as an independent candidate in 2016? As you are probably aware, Carson never shared political leanings on his show. He poked fun at all comers. He was quite conservative fiscally and liberal on the important social issues. He always carried a .38 revolver and would be aligned with the NRA. A dozen years before NBC ran The West Wing Carson Productions produced Mr. President, a sitcom starring George C. Scott as the President and Conrad Bain as his key advisor. Did you ever find yourself watching Martin Sheen, John Spencer et al and wondering what if? I loved West Wing. Our Mr. President was far too costly to produce with Mr. Scott. There were no regrets as I lobbied Barry Diller to cancel that show. The ratings were strong enough for renewal but the cost did not justify another season. Every year you traveled with Carson to watch Wimbledon. If you could visit the tournament together again which match would you and he rather watch, Isner–Mahut (2010) or Murray-Djokovic (2013)? Murray/Djokovic for sure. Johnny would have rooted for Murray out of respect for the home town favorite. The book is the memoir of a bromance shared between you and Carson. Given his lack of other friends and family it may well be the final word on him done in depth by a contemporary. It’s a portrait of light and dark. How did you determine to walk the line between tell-all sensationalism and paying tribute to a one-time friend and mentor? It took 3 years before I found the right voice. If I had written the book in the late 80’s the tone and content would have been different. But as they say, tragedy plus 30 years equals comedy. Once I found the right tone, the writing became easier. What did Carson have that later talk show hosts lack? Have you been on any of their shows to plug the book? I was not invited to any of those shows. I believe all his successors felt the book exposed some warts that they did not want to discuss or acknowledge. Johnny began his career in radio and before that he taught himself to be a skilled magician. To be good at Magic, one has to develop the gift of gab in order to divert the audience. He continued honing his skill while in the Navy which added to the patter necessary to keep the audience entertained. Years of radio work helped develop the skill even further. His followers in late night mainly did stand up without the skills that Johnny developed. For the guys behind the scenes is it true that there’s no business like show business, or is making money the same all over? It’s not the same all over. Johnny to my upset passed on a $100 million dollar deal with Coca Cola because he did not fancy sitting in a board room with a bunch of civilians. Today that stock would be with in excess of $2.3 billion. People on Wall Street would be horrified to learn that he passed because of this. What should be playing on the stereo when we’re reading Johnny Carson? Anything from the American Songbook. Johnny was a superb drummer who often times sat in with a band or quartet and took over the drums. Gershwin, Cole Porter or Johnny Mercer were all favorites particularly Mercer.